55. It was the opinion of the Supreme War Council that Allied troops should be sent to cooperate with the Russians, either at Murmansk or Archangel, against the Bolshevist forces, and the British Government, through its ambassador at Washington, urged American participation in this undertaking. On July 23, 1918, the War Department directed the dispatch of three battalions of infantry and three companies of engineers to join the Allied expedition. In compliance with these instructions the Three hundred and thirty-ninth Infantry, the First Battalion, Three hundred and tenth Engineers, Three hundred and thirty-seventh Field Hospital Company, and Three hundred and thirty-seventh Ambulance Company were sent through England, whence they sailed on August 26. The mission of these troops was limited to guarding the ports and as much of the surrounding country as might develop threatening conditions. The Allied force operated under British command, through whose orders the small American contingent was spread over a front of about 450 miles. From September, 1918, to May, 1919, a series of minor engagements with the Bolshevist forces occurred, in which 82 Americans were killed and 7 died of wounds. In April, 1919, two companies of American railroad troops were added to our contingent. The withdrawal of the American force commenced in the latter part of May, 1919, and on August 25 there was left only a small detachment of Graves Registration troops. 56. In accordance with the terms of the Armistice, the Allies were to occupy all German territory west of the Rhine, with bridgeheads of 30 kilometer radius at Cologne, Coblenz, and Mayence. The zone assigned the American command was the bridgehead of Coblenz and the district of Treves. This territory was to be occupied by an American Army, with its reserves held between the Moselle-Meuse Rivers and the Luxemburg frontier. The instructions of Marshal Foch, issued on November 16, contemplated that 2 French infantry divisions and 1 French cavalry division would be added to the American forces that occupied the Coblenz bridgehead, and that 1 American division would be added to the French force occupying the Mayence bridgehead. As this arrangement presented possibilities of misunderstanding due to difference of views regarding the government of occupied territory, it was represented to the Marshal that each nation should be given a well-defined territory of occupation, employing within such territory only the troops of the commander responsible for the particular zone. On December 9 Marshal Foch accepted the principle of preserving the entity of command and troops, but reduced the American bridgehead by adding a portion of the eastern half to the French command at Mayence. 57. Various reasons made it undesirable to employ either the First or Second Army as the Army of Occupation. Plans had been made before the Armistice to organize a Third Army and, on November 14, this army, with Maj. Gen. Joseph T. Dickman as commander, was designated as the Army of Occupation. The Third and Fourth Army Corps staffs and troops, less artillery, the First, Second, Third, Fourth, Thirty-second, and Forty-second Divisions, and the Sixty-sixth Field Artillery Brigade were assigned to the Third Army. This force was later increased by the addition of the Seventh Corps, Maj. Gen. William M. Wright commanding, with the Fifth, Eighty-ninth, and Ninetieth Divisions. The advance toward German territory began on November 17 at 5 a. m., six days after signing the Armistice. All of the Allied forces from the North Sea to the Swiss border moved forward simultaneously in the wake of the retreating German armies. Upon arrival at the frontier, a halt was made until December 1, when the leading elements of all Allied armies crossed the line into Germany. The Third Army Headquarters were established at Coblenz and an Advance General Headquarters located at Treves. Steps were immediately taken to organize the bridgehead for defense, and dispositions were made to meet a possible renewal of hostilities. The advance to the Rhine required long arduous marches, through cold and inclement weather, with no opportunity for troops to rest, refit, and refresh themselves after their participation in the final battle. The Army of Occupation bore itself splendidly and exhibited a fine state of discipline both during the advance and throughout the period of occupation. 58. 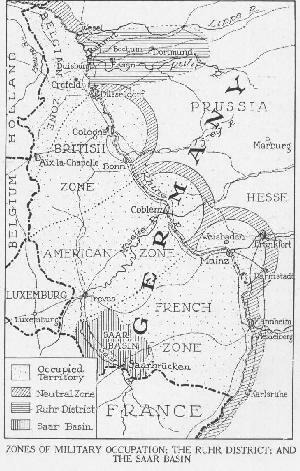 The zone of march of our troops into Germany and the line of communications of the Third Army after reaching the Rhine lay through Luxemburg. After the passage of the Third Army, the occupation of Luxemburg, for the purpose of guarding our line of communications, was intrusted to the Fifth and Thirty-third Divisions of the Second Army. The city of Luxemburg, garrisoned by French troops and designated as the headquarters of the Allied Commander-in-Chief, was excluded from our control. Upon entering the Duchy of Luxemburg in the advance, a policy of noninterference in the affairs of the Grand Duchy was announced. Therefore, when the French commander in the city of Luxemburg was given charge of all troops in the Duchy, in so far as concerned the "administration of the Grand Duchy of Luxemburg," my instructions were that our troops would not be subject to his control. Later, at my request, and in order to avoid possible friction, Marshal Foch placed the entire Duchy in the American Zone.